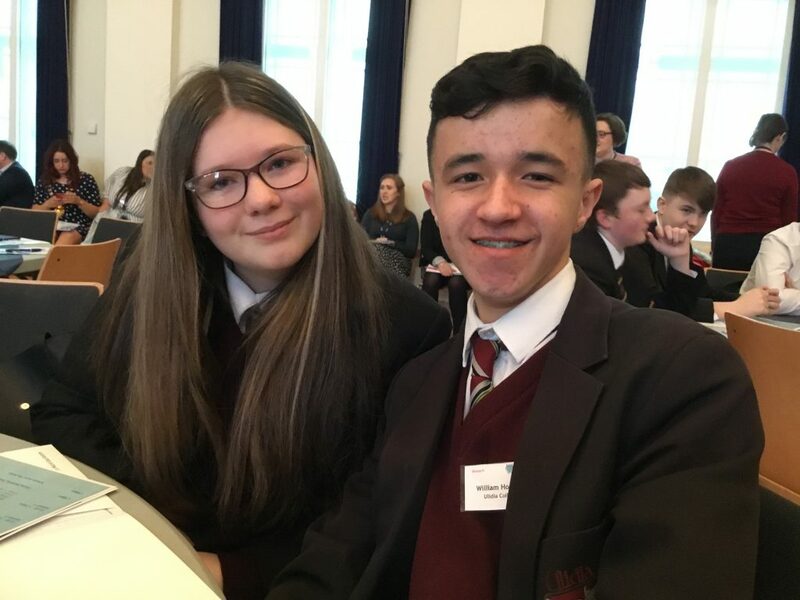 On Wednesday 6th February some students from year 11 Learning for Life and Work GCSE class joined Schools from across Mid and East Antrim at the Braid in Ballymena to attend the School Engagement Programme. The group were welcomed by the Mayor, Cllr L Millar, to the event. 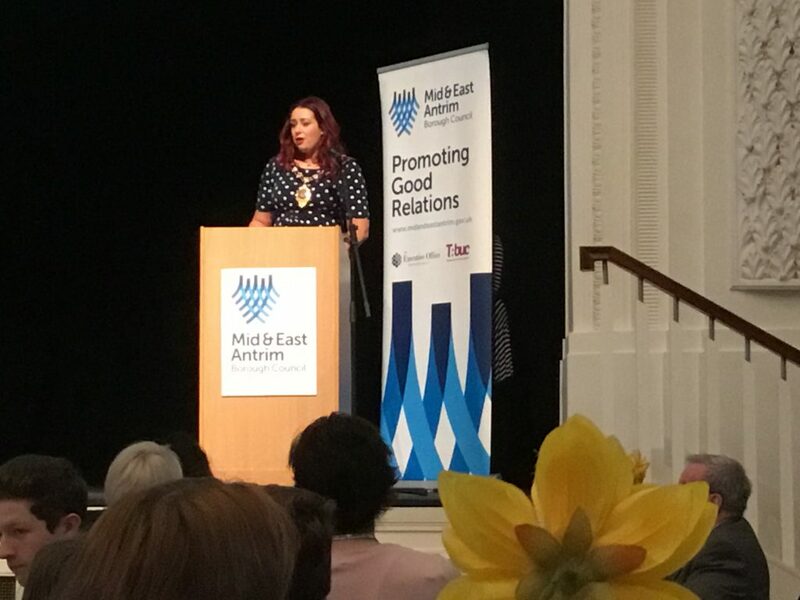 The mayor gave an overview of changes to the council in recent years and stated aims of the day which were to inspire students to participate in and with their local council. The warm welcome was followed by Jane Dunlop and the Good Relations Department within the council who gave a brief presentation about the role of the council. The group learnt about the local council buildings throughout the borough including our local office in Carrickfergus. The role of the council was explained through a short and informative video. The council came into existence in 2015 and covers more than 400m2 and provides a wide range of statutory facilities and services. The students were then divided into smaller groups with students from other schools to follow a programme of workshops. Students from the schools all played together in harmony to symbolise that we are all different but we can work together and be in harmony. Students took seats in the council chamber and were talked through a council meeting by the Deputy Lord Mayor. Students had the opportunity to use the council chamber technology to participate in the debate fully. When the Lord Mayor arrived and the Mace arrived the meeting began in earnest. Students took part in a mock meeting and discussed two reports which were debated. 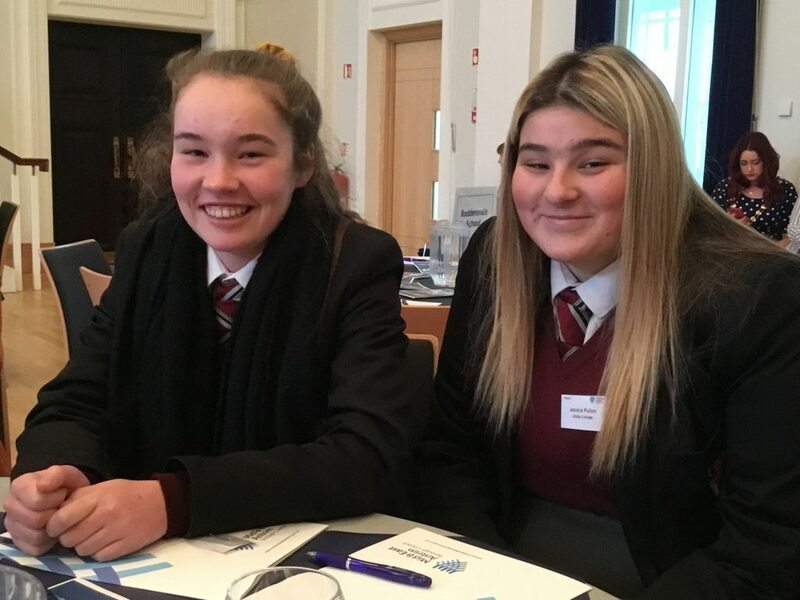 Students debated the banning of mobile phones in schools, having the opportunity to give input and to vote on the use of mobile Phones and social media. The second article for debate was raising age limit to 19 for driving licences. 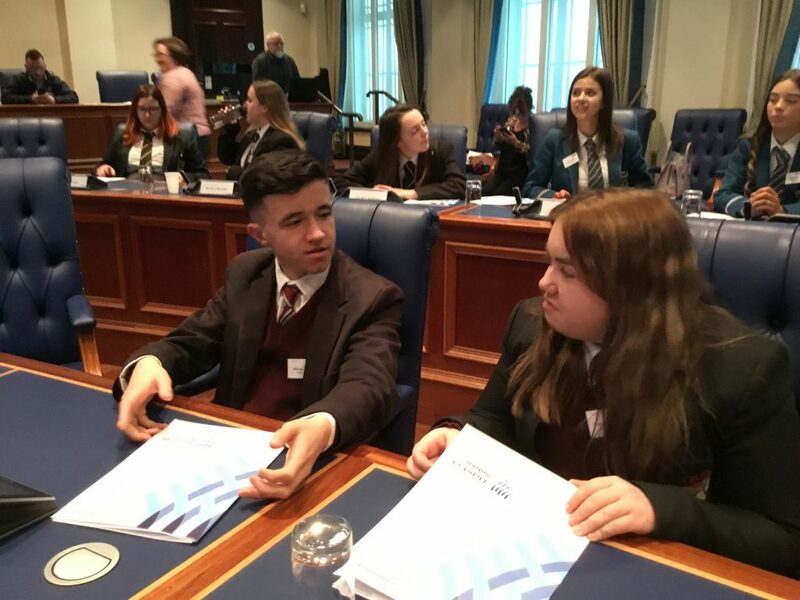 Molly contributed to this debate and suggested an amendment to the bill to not raise the age but to increase the minimum number of lessons that a young person can have before taking their test. Students had the opportunity to meet with local councillor Declan O’Loan who discussed his role with the students. Students learnt about he local council and how councillors are elected to council. 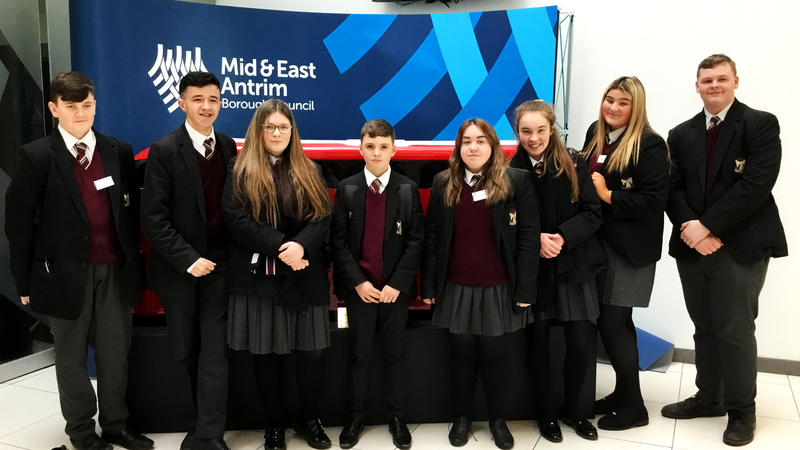 Mid and east Antrim council is one of 11 councils in Northern Ireland, and is responsible for making decisions on behalf of the local community. Councillors are elected every 4 years. Students found out about the decision making process in the council and how a proposal is made and the stages it goes through before being ratified or rejected. Students had the opportunity to ask questions about rates and how they are calculated and then spent by the council. Mid and East Antrim council have rated highly for recycling, students asked cllr O’Loan about future plant to improve this further including the three tier bin system. Recycling rates increased when all councils worked together and gave a consistent message, though bin surveys showed 25% of waste throughout Northern Ireland is food in MEA this is better than Northern Ireland average at 17%. 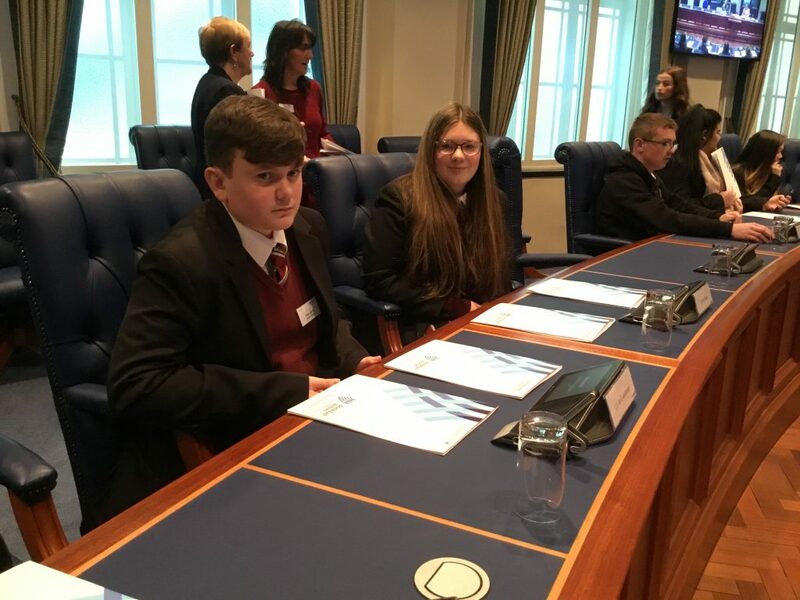 All students were taken on a tour of the council. The students got to see the Braid building and to hear about what happens in the rooms and offices of the building. The students had a fun and informative day at the Braid. Thank you to Mid and East Antrim council for organising the day for us to enjoy together.